Never say never: Adobe Labs is today showing off a couple of Flash applications for the iPhone/iPod Touch platform at its annual Adobe MAX event. 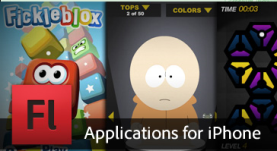 A couple of demo applications made by third-party developers are already available on the Apple App Store and are built using the brand new Flash Professional CS5, of which a public beta with pre-release support for building applications for iPhone is planned for later this year. You can sign up here if you want to be notified when the beta kicks off for real. Basically, Flash Pro CS5 allows developers to use Flash technologies to develop content for iPhone and iPod Touch devices that were previously closed to them. The Flash developer tool converts Flash apps into ones that can work on the iPhone, since the iPhone still does not support Flash. So this is a workaround. But developers can write new code or reuse existing web content to build applications for the devices, and because the source code and assets are reusable across the Flash Platform runtimes (Adobe AIR and Flash Player) it is aimed to also give developers a way to more easily target other mobile and desktop environments. More information is available here and soon, also here.